Western blot analysis of extracts from U-937 cells, untreated or TPA-treated (0.2 µM), using Phospho-PKCdelta/theta (Ser643/676) Antibody. Western blot analysis of Baculovirus expressed PKC isoforms alpha, beta, gamma, delta and epsilon, untreated or lambda protein phosphatase-treated, using Phospho-PKCdelta/theta (Ser643/676) Antibody (upper) or PKCalpha, -beta, -gamma, -delta and -epsilon antibodies (lower). 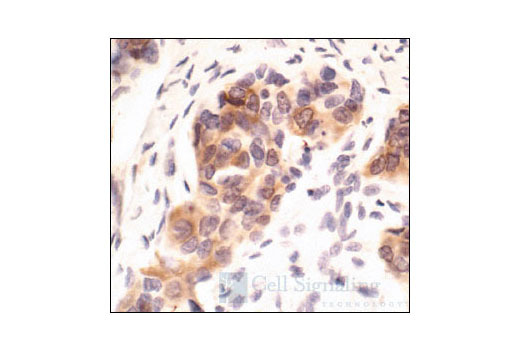 Immunohistochemical analysis of paraffin-embedded human breast carcinoma, using Phospho-PKCdelta/theta (Ser643/676) Antibody. 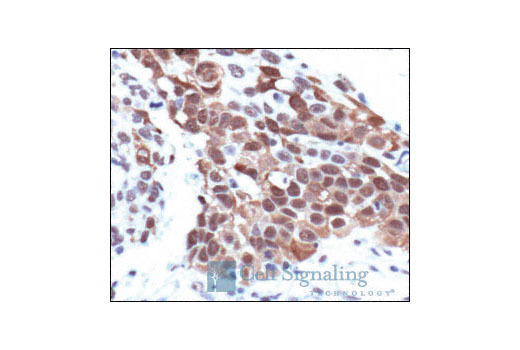 Immunohistochemical analysis of paraffin-embedded human lung carcinoma, using Phospho-PKCdelta/theta (Ser643/676). Antibody. 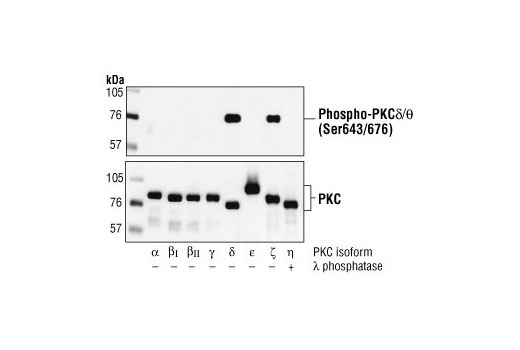 Phospho-PKCdelta/theta (Ser643/676) Antibody detects endogenous levels of PKCdelta only when phosphorylated at serine 643, and PKCtheta only when phosphorylated at serine 676. 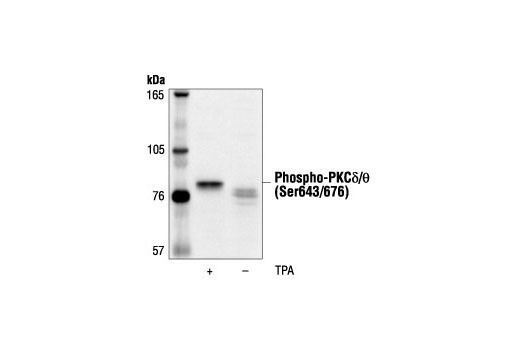 This antibody does not cross-react with the phosphorylated PKC isoforms alpha, beta, gamma or epsilon. Polyclonal antibodies are produced by immunizing animals with a synthetic phosphopeptide corresponding to residues surrounding Ser643 of rat PKCdelta. Antibodies are purified by protein A and peptide affinity chromatography.